Summary: Catherine Bailey has been enjoying the single life long enough to know a catch when she sees one. Gorgeous, charismatic and spontaneous, Lee seems almost too perfect to be true. And her friends clearly agree, as each in turn falls under his spell. At this year's BEA, I had one thing on my mind -- what are the big books that publishers are excited about? I spoke with quite a few people from Harper Collins, and almost every single person said INTO THE DARKEST CORNER by Elizabeth Haynes . So one of the first books I picked up when I got back home was, naturally, INTO THE DARKEST CORNER. I can honestly say that I was blown away by this novel... and totally freaked out. I debated whether I should feature INTO THE DARKEST CORNER as part of Mystery Mondays because it isn't a traditional mystery. However, it is most definitely a suspense/thriller; and since it's my feature, I decided that it belonged here. At it's simplest, INTO THE DARKEST CORNER is a psychological thriller about Catherine Bailey, a woman whose life turned drastically upside-down when her seemingly perfect boyfriend becomes controlling to the point of dangerous. The book not only delves into this toxic relationship, but it also explores Catherine's mental state four years after her boyfriend is incarcerated. The novel is very dark and very scary; and the author most definitely knows how to weave a story. In fact INTO THE DARKEST CORNER was the winner of Amazon UK Best Book of 2011. 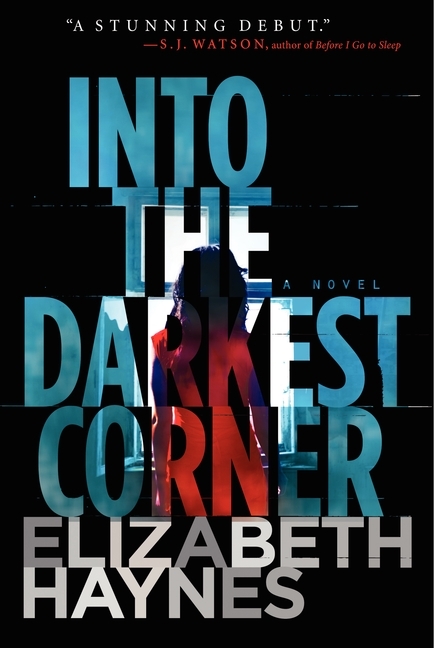 INTO THE DARKEST CORNER is not for the faint of heart -- it's pretty darn disturbing especially if you are a woman. One one hand, I found this book to be a fantastic read that I couldn't put down; but on the other hand, it was an uncomfortable read for me. I actually found myself one evening all alone reading the last 150 pages, and I had to stop because I was getting a little scared. I have to tell you that feeling is very unusual for me; and I can count on one hand, the number of times a book made me feel like this. I think that's a huge testament to the author and her ability to create "warped" characters and situations. There is no doubt that I enjoyed the basic premise of this story, but there were many other things about Ms. Haynes' writing that brought this book to the next level. First of all, I thought the presentation of Catherine's story (or should I say stories?) was extremely well done. The book alternated between the periods when Catherine was involved in her relationship with Lee, and four years later, when Catherine was suffering from the effects of that horrific time in her life. At first, I have to admit that I was a little bit disconcerted with how the book went back and forth, but I soon grew to appreciate it; and I think it was the perfect way to keep the reader engaged. Another fantastic thing about INTO THE DARKEST CORNER was the character development. I found Catherine to be a fascinating character and one that will remain in my thoughts for a very long time. The reader is allowed into Catherine's mind from the time she was a normal single girl in her early 20s, to when she was realizing that her relationship wasn't quite right, to when she became terrified for her life and planned an escape. Catherine's mental decline was incredibly interesting to me, and it was presented in such a way that made it seem very real. Furthermore, I found that the present day Catherine parts of the story were extremely well-done. Without giving away too much of the story, Catherine had some lasting effects from her traumatic experience including Obsessive Compulsive Disorder. While I don't claim to know much about this disorder, I do think that the author gave a very realistic portrayal of these actions; and she treated this behavior in a compassionate manner. I also appreciated seeing the various ways that Catherine worked to overcome her fears and cope with her day-to-day insecurities. One of my absolute favorite things about reading this novel was how I questioned the reliability of Catherine's story. I love novels with unreliable first person narrators and INTO THE DARKEST CORNER's Catherine most definitely played with my mind. Because Catherine had been through so much and clearly wasn't always the most stable of people, I had to wonder if parts of her story were exaggerated or whether some of the events she claimed even happened at all. It was gratifying for me at the end of the novel when everything started falling into place and the answers to many of my questions were revealed. As I read INTO THE DARKEST CORNER, I couldn't help but this that this novel would make a wonderful movie. I'm not a big movie-goer, but I think I'd make an exception to see this riveting story on the big screen. I have already started to imagine the various characters and how terrifying certain scenes would be. Overall, INTO THE DARKEST CORNER was a roller-coaster read for me. The novel was full of ups and downs and twists and turns, I had no idea what was coming after each turn. Highly recommended for fans of psychological thrillers! Boy does that sound creepy! I used to read a lot of books like that but haven't in quite a while. I can't wait to pick this one up. EEK! I got the chills just reading your review, which is excellent. When I'm in the mood for a disturbing read, I'll pick this one up! This book sounds great. Thanks for the review and for alerting me to it. So thrilled you loved this one as much as I did! I convinced one of my book club members to read this one last night. I hope it's not too disturbing for her! I did warn her!